Updated 11/14/18 --- Updated for the 1.47.49 (November 13, 2018) game patch. 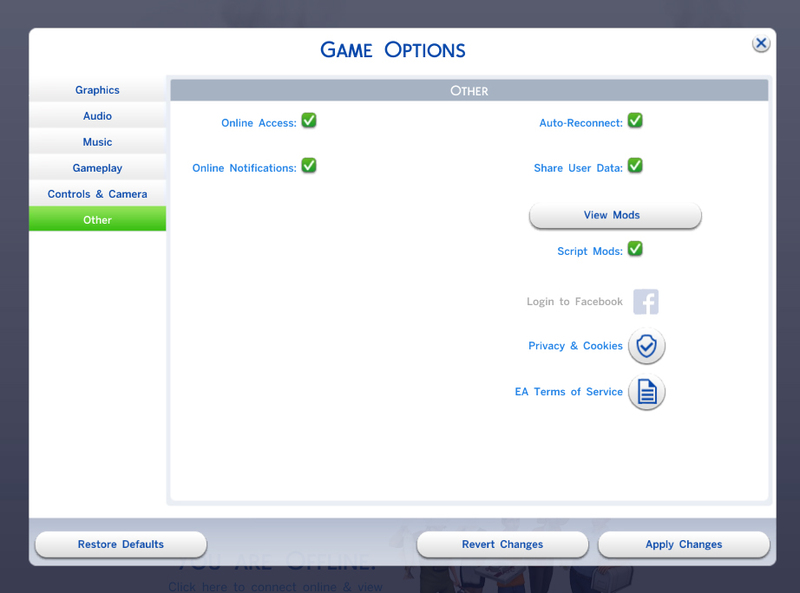 This mod adds two commands to The Sims 4 cheat console to enable you to configure how much earlier than the default your sims will wake up. This is ideal for large households where it can be difficult to manage getting all sims ready for work or school on time. It works best with ReubenHood's "Sleep All Night" mod. Why a script mod? While it would have been easy enough to edit the tuning variables for all the careers to set sims to wake up earlier, for small families or single sims the default wakeup time of two hours before work is often adequate. For families of four or so, an extra hour is useful. For large families, two extra hours or more can be ideal. 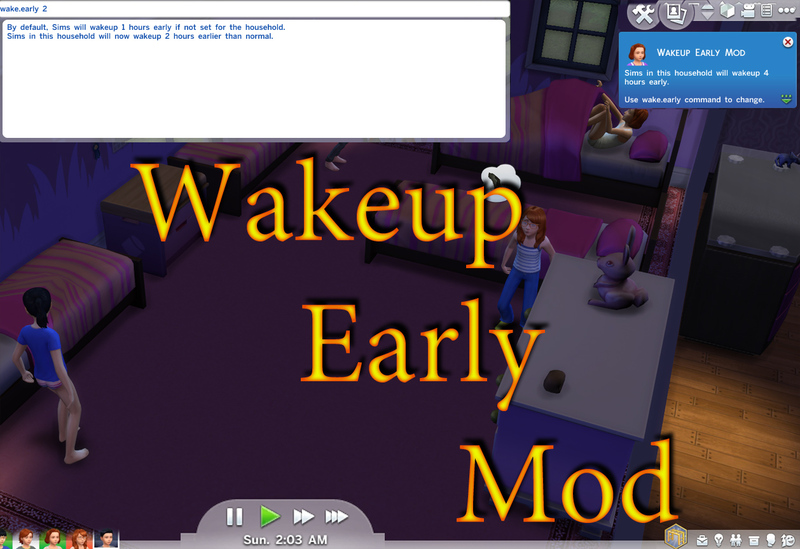 By using a script mod it is possible to fine tune the early wakeup time on a per-household basis. This method will also work with any new careers and will not interfere with any mods that alter careers. This mod will allow you to set each household to wake up early anywhere from 0-6 hours. Your settings are saved automatically to a configuration file in your mods folder and loaded each time you switch to a new household. When you switch to a new household, a notification will appear reminding you of your settings for that household. The early wakeup time is also considered by your sims to choose when they should go to bed at night. Sims that don't have a school or work wake up time will not be affected and will wake up at the regular default of 8:00 AM. wake.default # - This command sets the default number of hours you want any household that you haven't specifically configured for another time. So you can set all famlies to wakeup one hour earlier than nomral using the command wake.default 1 The number should be between 0 (off) and 6 (maximum). You can leave the number off to get a reminder of what your default is set to. Note that changing the early wakeup time while sims are asleep will not take effect until the next day. Extract the MTS_Scumbumbo_Wakeup_Early.ts4script file from the download and place that file into your mods folder. If you wish it can be placed into a subfolder, but only one level deep. This mod was written and tested on version 1.47.49 of The Sims 4 (Nov 13, 2018) of The Sims 4, and should be compatible with later versions. Since this contains only new commands added to the game, it should not conflict with any other mods. The configuration file is saved in a file, "MTS_Scumbumbo_Wakeup_Early_Configuration.cfg" in the mods folder. The configuration file can be deleted to reset all configurations or if the mod is uninstalled. The values for each household are stored on a separate line as "household_id=hours". The first entry, household 0, is the stored default value. How it works: The majority of the mod deals with initialization and storing and loading the configuration values. The real work is done by overriding the get_next_wakeup_time() function of the CareerBase class. The override simply adds a few lines to calculate and return the new wakeup time. The normal value is returned if the early wakeup is turned off for that household. If you have any questions about how something is working in the mod, feel free to drop me a personal message here on MTS. For best results, consider also using ReubenHood's "Sleep All Night" mod!